I was turned on to this recipe by a friend this past week and I must say this cake is dreadfully sinful! Sinfully delicious! I’ve personally eaten half of this cake and I just took it out of the oven 24 hours ago. Apparently this recipe has been floating around the internet for a few years but I never came across it, so I don’t mind sharing it because some of you may not have seen it and I can promise, everyone needs to try it. Easy, super delicious, what more can you ask for? You start with a boxed mix but don’t follow the directions and you add a tub of store-bought icing but it goes IN the batter instead of on the cake. Give it a shot! If you love pecans, this will surely please. Preheat the oven to 350F. Spray a 9×13 baking dish with nonstick cooking spray. I personally use the ones with flour for baking, like Baker’s Joy or generic equivalent. In a medium bowl or the bowl of your stand mixer, if you have one, combine the boxed cake mix, eggs, oil and the tub of frosting and run the mixer to combine well. Fold in the pecans and then pour into your greased baking dish (I used a pyrex one). Bake about 40 minutes or until golden brown and when a toothpick comes out clean. The cake would be perfect to eat at this point but the sauce puts it over the top! To make the sauce, melt the butter in a small saucepan. Add the condensed milk and stir while heating through. Add the remaining 1/2 cups of pecans and cook, stirring, for another minute or so, then remove from the heat. Now at this point you can cut the cake and spoon the sauce over it, or do as I did and just pour the sauce all over the top of the cake. I think this is best because the sauce soaks down into the cake, sort of like making a tres leche cake. It’s hard to believe, but I’ve made it over 1 year smoke free. After nearly 30 years of being a smoker, I finally kicked that habit. Those of you that have stopped smoking know this and the smart people out there that never picked up the nasty habit might not, but like others my metabolism went in the toilet when I quit. I ate no more than when I smoked but weight just piled on. I went from my smoking weight of 195 to 225 before I managed to peel off 20 pounds this past summer. Still, the battle of the gut is a constant struggle with me. Working in the food industry, I am surrounded by it 12 hours a day, everywhere I turn! A lead cook will want me to try some sauce (made with butter and whipping cream of course), or my baker will prepare some new treat that I can’t resist tasting, so I’m always interested in bite-sized desserts and treats. These tasty little morsels allow those of us that can quickly consume 1000 calories in a matter of minutes, to enjoy the deliciousness of something decadent and still keep our daily caloric counts in check. A slice of a common pecan pie like you’d make at Thanksgiving averages about 500 calories (that’s if you slice your pie into 12 servings). If you’ve purchased your pecan pie that number can double, as most thaw-and-serve pies have crusts made with lard.These tasty little phyllo cups have 75 calories each, so you can limit your intake and not feel so guilty. The crispness of the baked phyllo cup with the sweetness of the praline filing and the toasted pecan is just delectable. These are perfect for a party, tea, reception, shower or just to keep in a Rubbermaid container around the holidays. They make great treats for gift giving, especially when pared with some homemade cookies, and they are extremely simple to make. Give them a try and I’m sure you’ll love adding these to your holiday baking repertoire. In a mixing bowl, combine all ingredients except the pecans and mix well. Fold in the chopped pecans. Arrange phyllo cups on a baking sheet, then spoon mixture into the phyllo cups (a heaping teaspoon is a good size to fill the cups). Any extra filling can be evenly distributed between your phyllo cups. Bake in a 350F preheated oven for 10-15 minutes, until the filling sets, the pecans begin to brown the the phyllo cups brown around the edges. Transfer baked cups to a cooling rack and begin your next batch. Be sure to cool these tartlets completely on a cooling rack. If you cool them on a pan or plate they will become soggy on the bottom and you loose that wonderful crunchiness of the phyllo pastry. It’s been a month since I’ve posted anything, and for those of you that follow my blog I apologize. Most of you know I’m executive chef for a liberal arts university and we’ve been doing a lot of catering work leading up to summer graduation, which was yesterday, so my time has been short the past month. As is customary for every graduation on campus, I create/prepare an upscale dinner for the board of directors and the guest speaker from graduation. Last night’s meal was a filling one, beef tenderloin with portobello-Madeira sauce, roasted purple and pink potatoes and sauteed broccolini, so for dessert I needed something light. 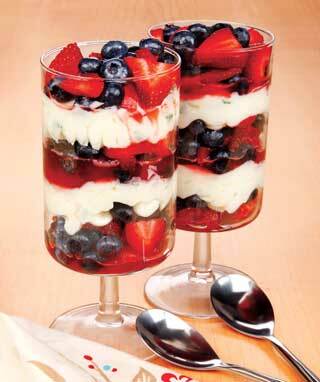 Since fresh berries are plentiful right now, I made a simple fresh berry parfait. The guests were really impressed with the flavors and wanted to know just what I did. They were shocked when I told them, because this is so simple to do. It’s a way to heighten the flavors of the fresh fruit without covering it up, so while berries are everywhere you should pick some up and give this a try! 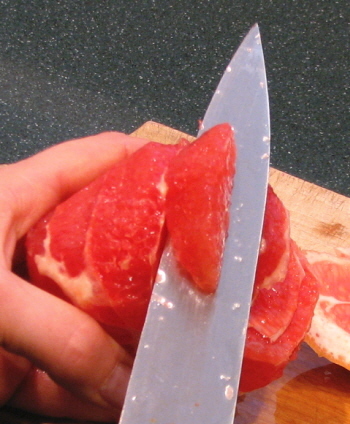 To prepare the fruit, simply put all washed and cut fruit in a large bowl. Sprinkle with the sugar, lemon juice and liqueur. 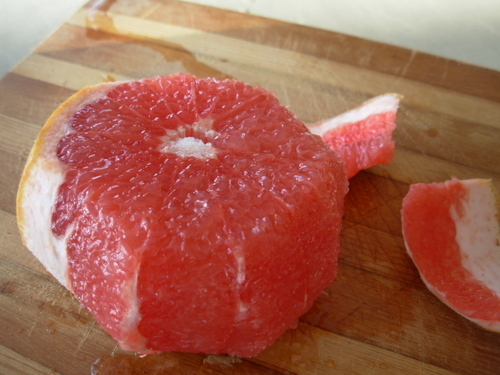 Let marinate in the refrigerator for at least 1 hour. In a small, heavy saucepan, heat the cream and vanilla until bubbles start to form around the edges of the pan. While the cream is heating, whisk together the eggs and sugar until smooth. Slowly pour 1/2 the hot cream mixture into the eggs, whisking constantly. Gradually add the egg yolk mixture back to the pot of remaining cream, whisking constantly, and cook until it thickens and will coat the back of a spoon. Spoon fruit mixture in a parfait glass, alternating between layers of the macerated fruit and the chilled cream anglaise. Serve cold. It’s been a few months since I updated the blog, and I apologize to my followers. Back in August, I transferred from corporate dining to campus dining and I’ve been working around the clock ever since. Things are starting to calm down at work, just in time for the holidays, so I’ve been dusting off some family recipes. This is the one time of the year when I will actually do some baking. Baking is a science and requires one to follow a recipe more closely. Those of you that know me well, know that I rarely follow a recipe as written, so baking has never been something I was enthused to do. Still, I hold the family recipes and the family expects cookies, cakes and pies when the holidays roll around. Everyone knows how to make sweet potato pie but most people have only had the whipped up version. This version is different. It’s more elegant that something dumped out of a can. As you can see by the photo, it makes a beautiful dessert plate for the holidays and it’s not much more complicated that the baby food version. Preheat the oven to 375F. 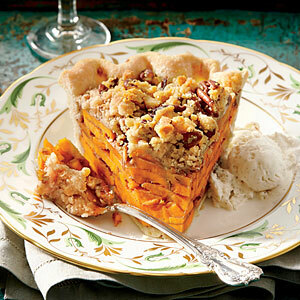 Fit the piecrust into a 9″ deep-dish pie plate, folding the edges under and crimping. In a Dutch oven, bring the potatoes, granulated sugar, orange peel and 1 cup of water to a boil. Cover and reduce heat to medium and simmer 6-8 minutes until potatoes are just tender. Transfer the potatoes to a large colander, reserving the cooking liquid. Rinse the potatoes with cold water. Transfer the cooking liquid and orange peel strips to a small saucepan and bring to a boil over medium high heat. Reduce heat to medium and simmer, stirring occasionally, until reduced to 1/4 cup. Reserve 2 tbsp of the potato-orange liquid and discard the rest. Transfer the potatoes to a bowl and toss with brown sugar, flour, spice and orange zest and the reserved 2 tbsp of the potato-orange liquid. Spoon into the crust. Sprinkle with streusel and bake for 1 hour and 15 minutes, shielding with foil after 30 minutes to prevent excessive browning. Cool completely and serve at room temperature. As usual, we headed down to Pepper Place market this morning for some locally grown produce and I just couldn’t resist some freshly picked Chilton County peaches. I did my part to help the local economy and bought a big basket full. Chilton County peaches are some of the best peaches you can buy and some think they are more tasty than their counterparts across the border in the peach state. 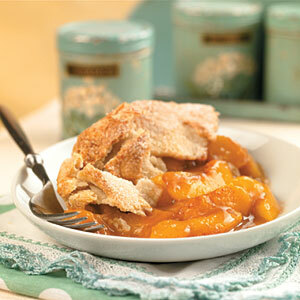 Although I definitely don’t need the added sugar in my diet, I’ve got a peach cobbler in the oven as I type this. My recipe was handed down from my grandmother and it’s easy and foolproof. 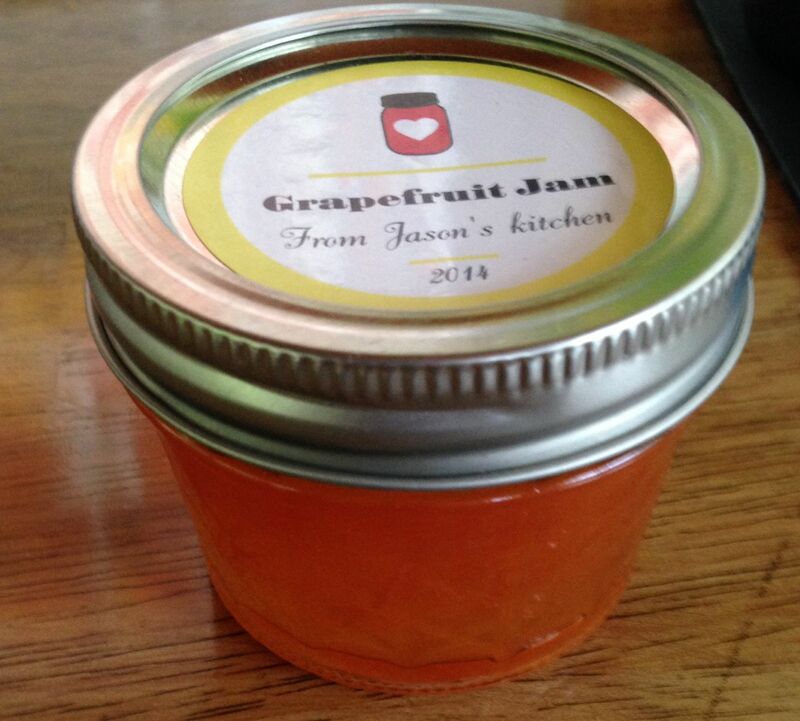 So go pick up some delicious ripe peaches and give this one a try. You’ve probably got all the ingredients in your pantry or frig! Preheat the oven to 350F. Pour the melted butter into a 13″x9″ Pyrex dish. In a mixing bowl, combine the flour, sugar, baking powder, salt and milk. Mix well to combine and remove lumps. Pour the batter over the melted butter but do not stir. Next top the butter with the peaches, again do not stir (as the cobbler bakes, the crust rises and the peaches fall). Sprinkle top with lemon juice, cinnamon and nutmeg. Bake for 35-45 minutes or until bubbly and golden brown. Serve with a scoop of some rich vanilla ice cream. Cobbler can be stored at room temperature, covered with plastic wrap. After a long weekend camping with our “girls”, I ran in Walmart for some groceries and saw strawberries on sale for $1.49 a pound. They weren’t on my list but I couldn’t pass them up. I then came home and made this decadent dessert (that we don’t need to eat but will). It’s so simple to make something like this that I thought I’d share my recipe. Give it a shot! Add some bananas if you’d like or some blueberries. You can put any fruit in place of the strawberries. In a glass 4 cup measuring cup or something similar and microwavable (I use a Fire King Jadite batter bowl), combine the pudding and the evaporated milk (3 cups), stir and microwave on high for 5 minutes, stopping in one minute intervals to stir. In the end the pudding should be thickening up. Once the cooking process is over, press plastic wrap onto the top (so it won’t form a “skin”) and refrigerate for an hour. While the pudding is cooking/cooling, slice the pound cake lengthwise into 3 layers. Spread the strawberry jam evenly between the layers like filling in a cake. Reassemble the pound cake and cut into slices about 3/4″ thick. 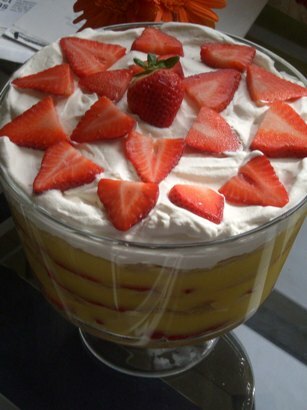 In a large bowl or trifle bowl, arrange the cake layers on the bottom to cover as best possible. Top the cake layers with 3/4 of the sugared strawberries. Pour the cooled pudding over the strawberries, then top with the Cool Whip. Arrange the remaining strawberries on top for decoration and refrigerate the whole bowl for 2-24 hours before serving. Here’s an easy dessert you can serve at your next dinner party and really impress your guests! This recipe is adapted from Paula Dean’s recipe. Preheat the oven to 425F. Lightly grease 6 custard cups or ramekins. 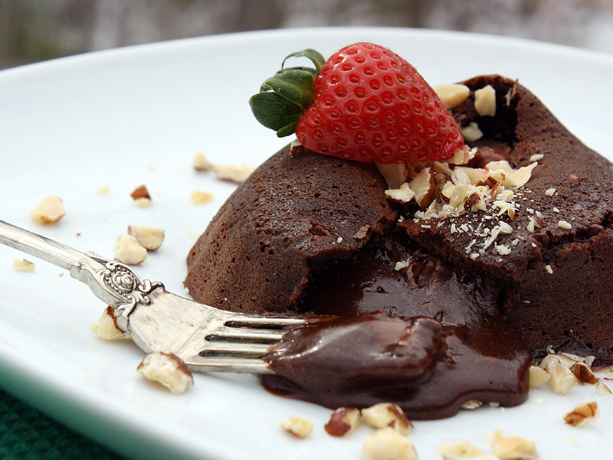 In a Pyrex bowl (or any other microwave safe bowl), melt the butter and chocolate in the microwave on high for 30 seconds at a time, until melted and well blended. Add the flour and powdered sugar, then stir in the eggs and egg yolks and mix until smooth. Add the vanilla extract and the coffee. Divide the batter evenly between the custard cups. Arrange custard cups on a baking sheet and bake for 14 minutes. The edges should be firm but the center still slightly jiggly. Run a knife around the edges of the custard cups and invert the cakes onto dessert plates. Let sit for 3-4 minutes, then dust with powdered sugar and garnish. Serve warm. Combine the crushed cookies, coconut and butter in a bowl and mix well. Pat crumb mixture into a 8″-9″ pie pan, pressing up the sides so it’s even all over. Bake the crust in a 350F oven for 10 minutes, then cool completely on a wire rack. While the crust is baking, in a heavy bottom saucepan, combine the sugar, cornstarch and pineapple. 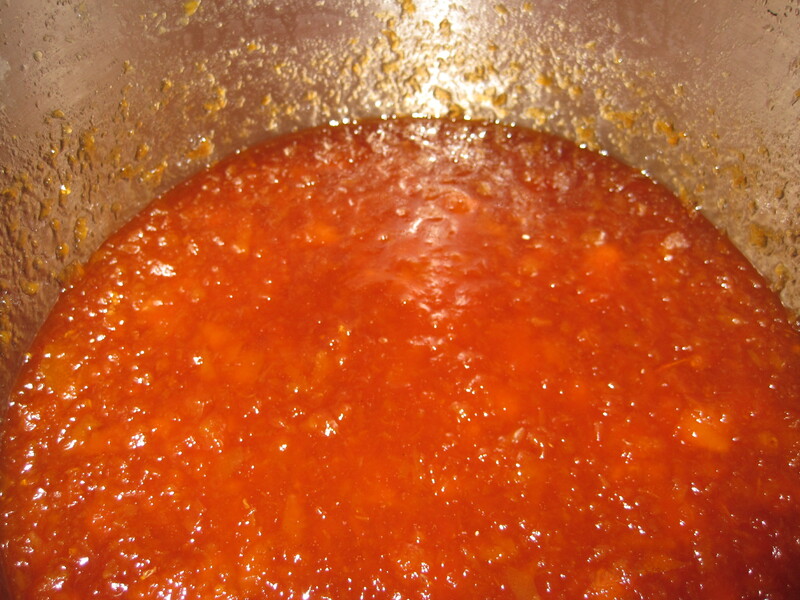 Cook over high heat, stirring constantly, until the mixture thickens to the consistency of pineapple jam. Pour from pan into a bowl and let cool completely along with the crust, at least 20 minutes. Meanwhile, in the bowl of a stand mixer with a whisk attachment, beat the cream cheese until smooth. Add 1 cup of coconut milk (the rest can be kept covered in your fridge for later use), then add the eggs, 1 at a time, beating just until combined. On the cooled crust, spread the pineapple mixture in a single layer, then top with spoonfuls of the cream cheese mixture and spread even. Bake at 350F for approximately 40 minutes, until pie is completely set. Cool on a wire rack for 1 hour, then cover and chill for 4 hours. Just before serving, beat the chilled whipped cream in a chilled bowl with chilled beaters until stiff peaks form. Swirl in remaining coconut milk. 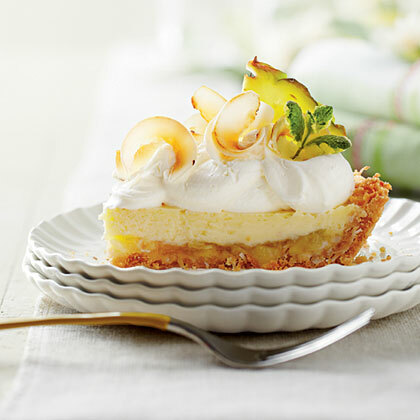 Top the pie with the whipped cream and garnish with toasted coconut, pineapple, etc. To toast coconut, arrange on a baking sheet in a thin layer and bake at 350F for 4-5 minutes until lightly browned. Even after making numerous pecan pies for Thanksgiving, I’ve still got plenty of pecans left from this year’s crop produced by the big tree out back. With that in mind, I ran across a recipe in a recent Southern Living magazine for pecan pie bars and decided to give it a try. Like most every recipe I find, my end result varies a little because I’ll add a little of this or a dash of that; anything I think will improve the end result. These are delicious! If you’re looking for something different to take to a party or give as a gift this year, give these tasty bars a try! First, preheat your oven to 350F. Arrange the pecans in a single layer on a sheet pan and cook for 8-10 minutes, until lightly toasted and fragrant, stirring halfway through. Line the bottom and sides of a 9″x13″ pyrex dish with heavy-duty aluminum foil, leaving 2-3 inches on each side to extend over the sides of the pan. Lightly grease the foil (I just spray with Pam). In a food processor, pulse the flour, powdered sugar, cold cubed butter and cocoa 5-6 times, until the mixture resembles coarse meal. If you don’t have a food processor, you can use a pastry blender tool or even your hands. Press the mixture into the bottom and up the sides of your glass dish. Bake at 350F for 15 minutes. Remove from the oven and sprinkle the crust with the chocolate morsels. Let cool completely in the pan on a wire rack (about 30 minutes). While the crust is cooling, whisk together the brown sugar, corn syrup, melted butter, bourbon and the eggs until smooth. Stir in the coconut and toasted pecans and spoon mixture into the cooled crust. Bake at 325F for 25-30 minutes or until golden brown and set. Cool completely on a wire rack (about 1 hour), then chill for 1 hour in the refrigerator. Lift the baked bars from the pan using the aluminum foil sides as a handle. Transfer to a cutting board and cut into bars. Peel off the foil and enjoy!